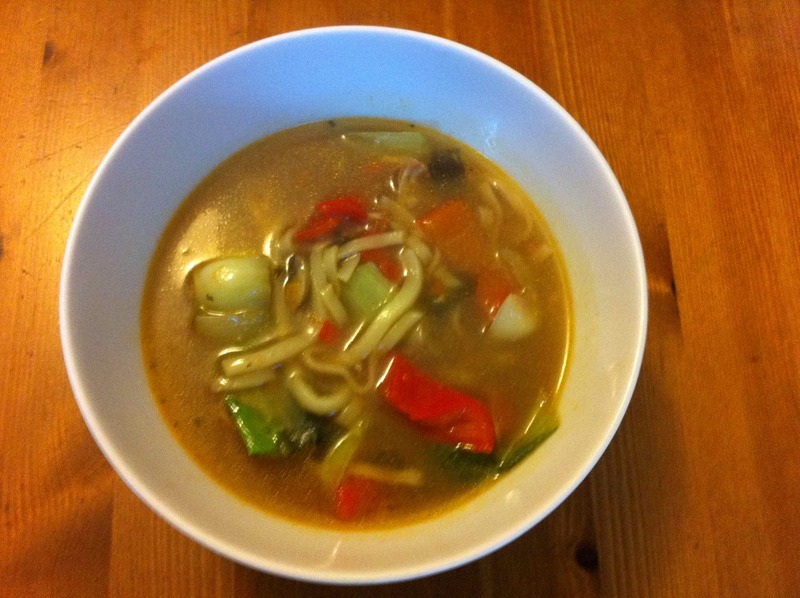 Last night on request from my daughter Eleanor I made Ramen soup. She is sleeping at school tonight and then off tomorrow on her African World Challenge adventure to Kenya and Tanzania! I fried chopped red chillies and garlic in olive oil and then added a chopped red pepper and some chopped chestnut mushrooms. Meanwhile I grilled some chicken breasts, chopped them and added to the rest. 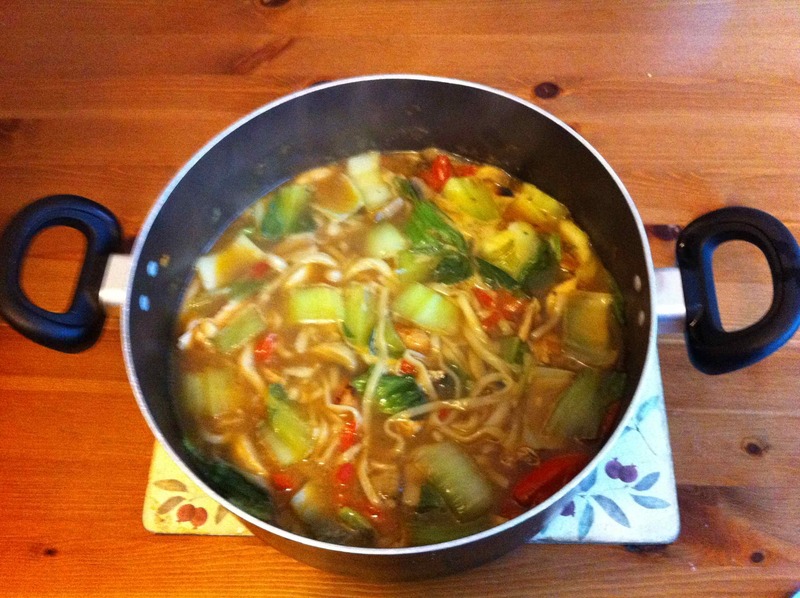 I then added two sachets of miso soup, water and half a chicken stock cube. A dash of soya sauce, Thai fish sauce and some seasoning and then left it to cook. I also added some noodles and a Ramen soup mix to add more flavour. Just before serving I added some pad choi to give it a bit of greenery. It was hot, spicy and delicious! Nothing can beat a nice salad in hot weather! 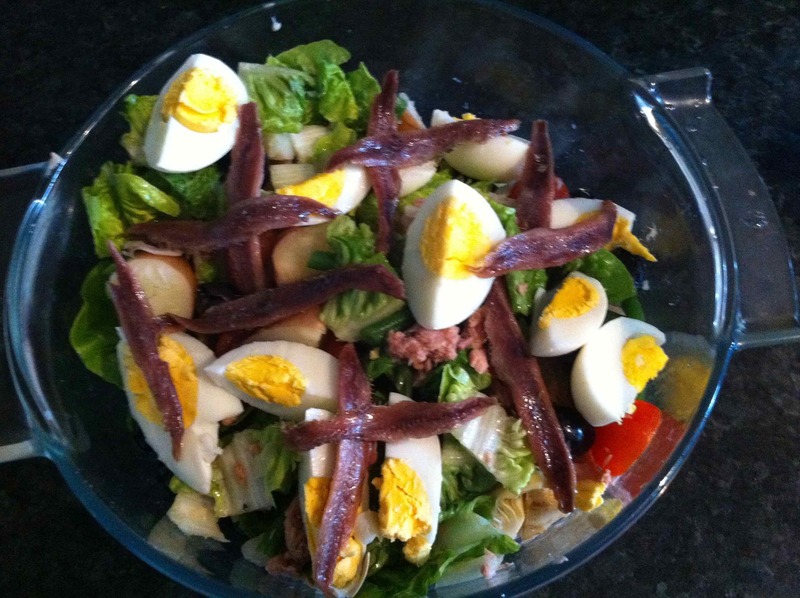 At the request of my daughter Eleanor I made salad nicoise last night. I boiled some potatoes, eggs and green beans and once cooked I added these to gem lettuce, black pitted olives, tuna, anchovies, baby tomatoes and artichokes. I made an Italian dressing with olive oil, balsamic vinegar and coarse grain mustard. 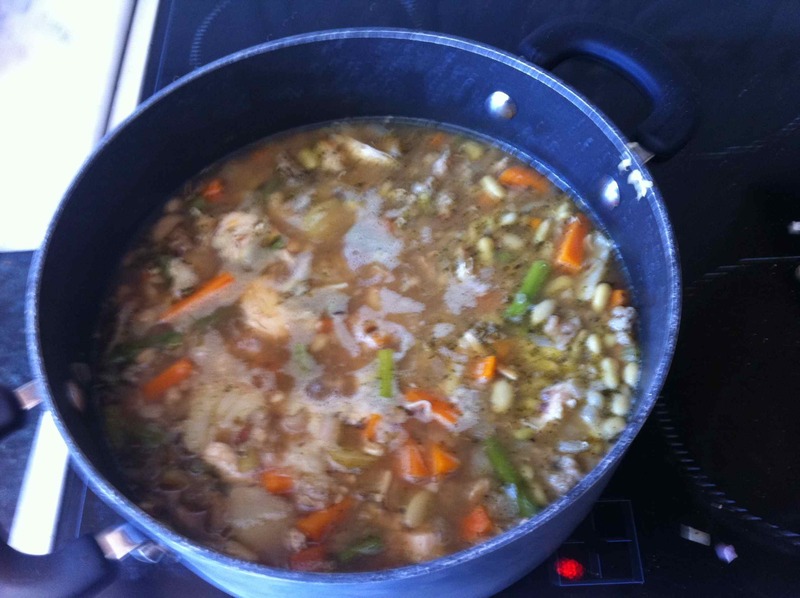 To use up the leftover’s from last night’s roast dinner I made a soup. 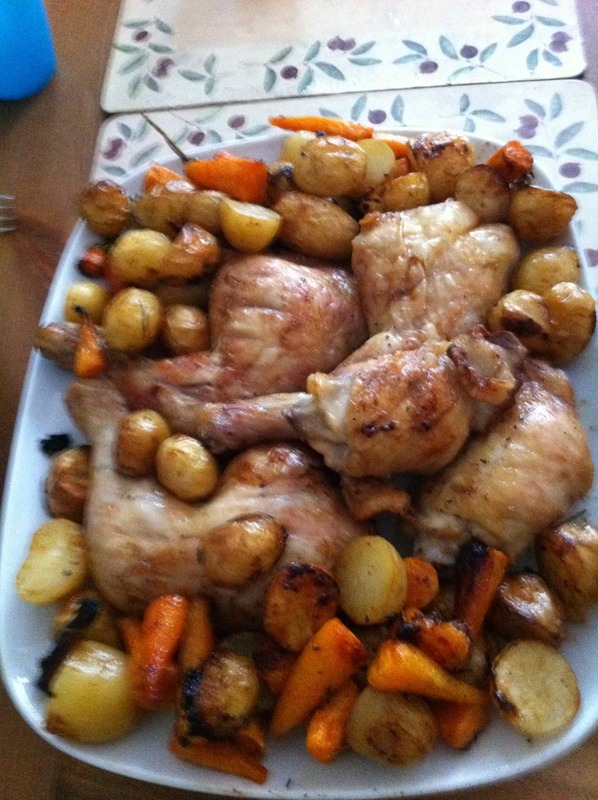 I fried chopped shallots and garlic and then added the chicken, vegetables, potatoes and stuffing. Then I added a pint and a half of chicken stock and some seasoning and left to simmer. As an afterthought I added a tin of flageolet beans! Very warming! 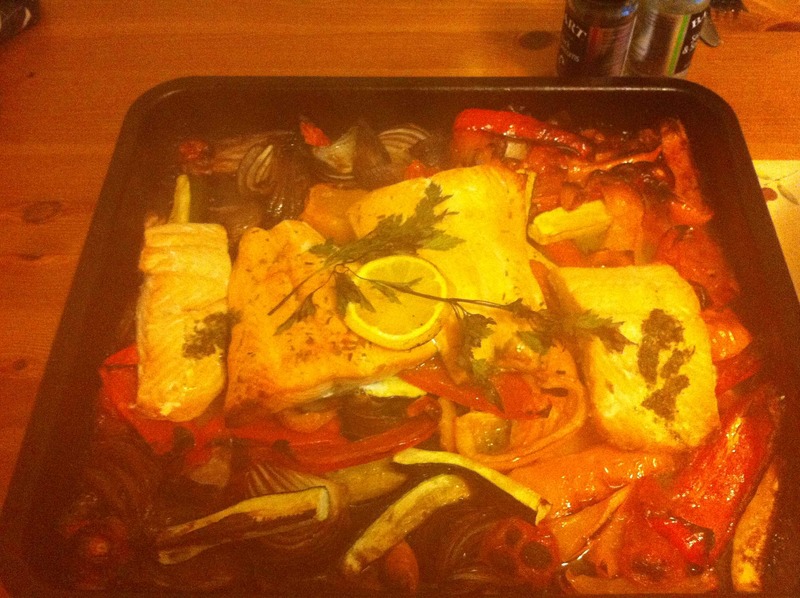 For the main last night I made baked salmon with roasted vegetables. Bake a mixture of red and orange peppers, onions, garlic and courgettes in olive oil for about twenty minutes. Then place salmon fillets on top and drizzle the juice of a lemon over it and cook for another 15 – 20 minutes. Serve with new potatoes and a green salad and a nice chilled Chablis! 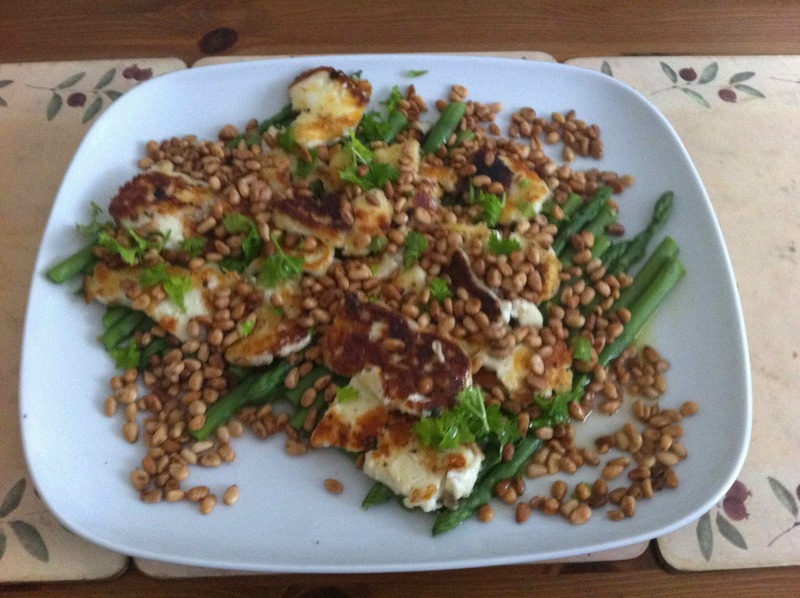 This was a new starter for me, I had some Halloumi cheese to use up and came across this recipe on the Internet. First cook the asparagus for about four minutes. Coat the Halloumi cheese in flour and seasoning and fry until golden. Meanwhile, bake the pine nuts in the oven. Arrange on a plate and add a dressing of olive oil, lemon juice and parsley. Delicious! After a day at work all I wanted was something simple and tasty. 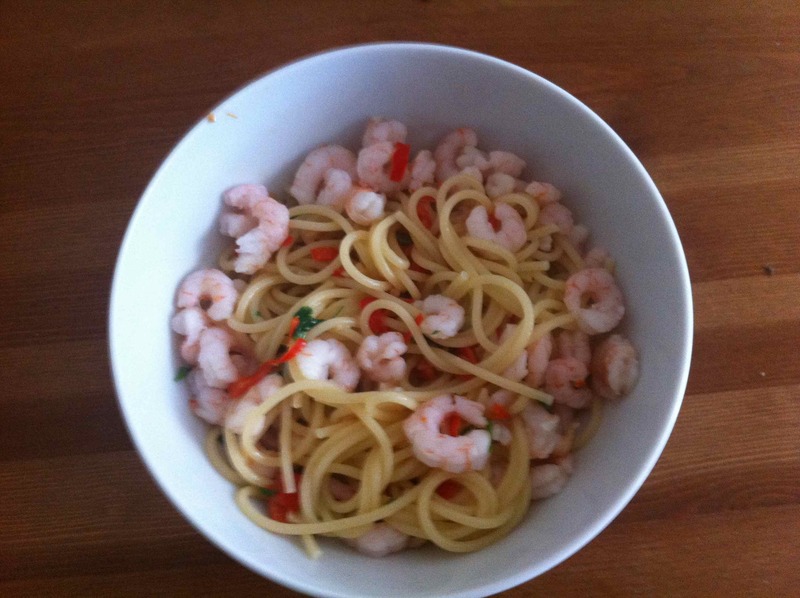 I cooked spaghetti with prawns in garlic, chillies and lemon. Fry the chopped chilli and garlic till golden, then add prawns and lemon juice, heat through and add a little chopped coriander. 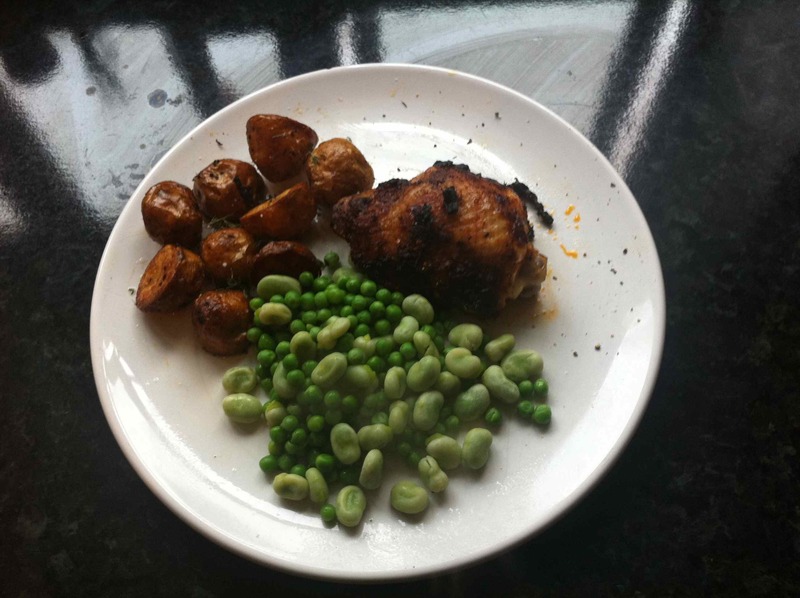 Using up leftovers or stuff from the freezer is always fun 😉 Tonight I cooked baked chicken marinated in Harissa sauce with baby potatoes baked in olive oil, garlic and fresh thyme! To use up the leftover rosemary that I had, tonight I marinated a lamb steak in red wine vinegar, olive oil and red wine, with garlic, rosemary and seasoning. I let it marinate for as long as possible – at least three or four hours – would have been better if I have time to leave it over night! Once ready I grilled the lamb. 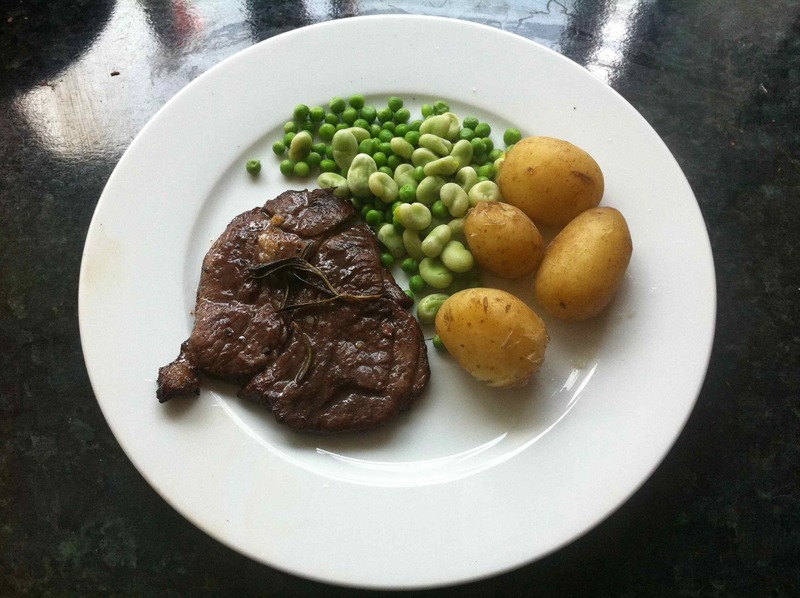 Served with new potatoes, peas and broad beans! A simple, but good Sunday supper! I cooked this as the main course last night, based on a recipe from one of my new South African cookery books. Add new potatoes and baby carrots to hot olive oil in a pan, season with salt and paper and some rosemary. Place chicken legs on a rack over the vegetables and cover with oil and salt and pepper. Pour the juice of 3 lemons over the chicken and bake for an hour or so at 200 turning the chicken once. Really nice and so simple! 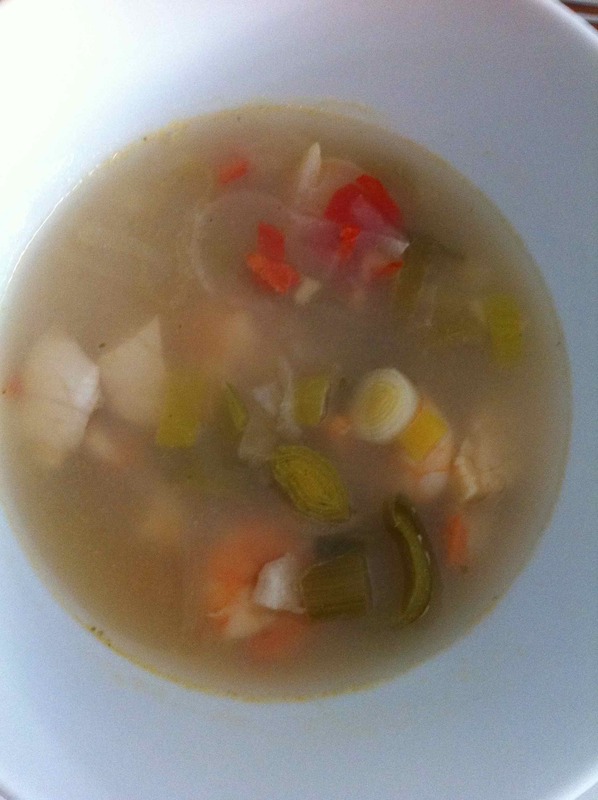 For a starter last night I cooked Thai prawn and scallop soup – so simple to make but utterly delicious! To about a pint of fish stock add the juice of half a lime, some sherry, one chopped leek, two chopped shallots, one crushed lemon grass, chopped ginger and 1 red chilli. Bring to the boil and cook for about ten minutes. The add the prawns and scallops and cook for a few minutes!